After getting the hang of using my Silhouette to make designs for shirts, I had a lot of fun coming up with ideas for onesies for a friend’s baby boy to be. Her other sons love construction vehicles and her husband works in the construction industry, so I went looking on the Silhouette Online Store for some fun vehicles. I really love how this turned out, especially the contrast of the yellow on the black giving more relate-ability to the construction motif. This was simply heat transfer material cut out and ironed on in alternating locations. The next onesie is a cute little dinosaur that I found in a dingbat font and thought that some plant fabric would be fun to use as an appliqué. After ironing on sewable interfacing and cutting out the fabric, I just ironed on the dinosaur to the onesie and stitched around the edges. This next onesie was the one that was by far the most difficult. The idea came to me to try to make a tool belt for a baby to hold some tools. I found a tool belt on the Silhouette Online Store and ungrouped it to get it down to the basic shape. I made the mistake of leaving the buckle in the belt which was really hard to try to stitch over. If I did it again I would just have left it out or used heat transfer material for it. Once I cut out, ironed on, and stitched the belt, I used a Tool Font to cut out some tools in Heat Transfer material. 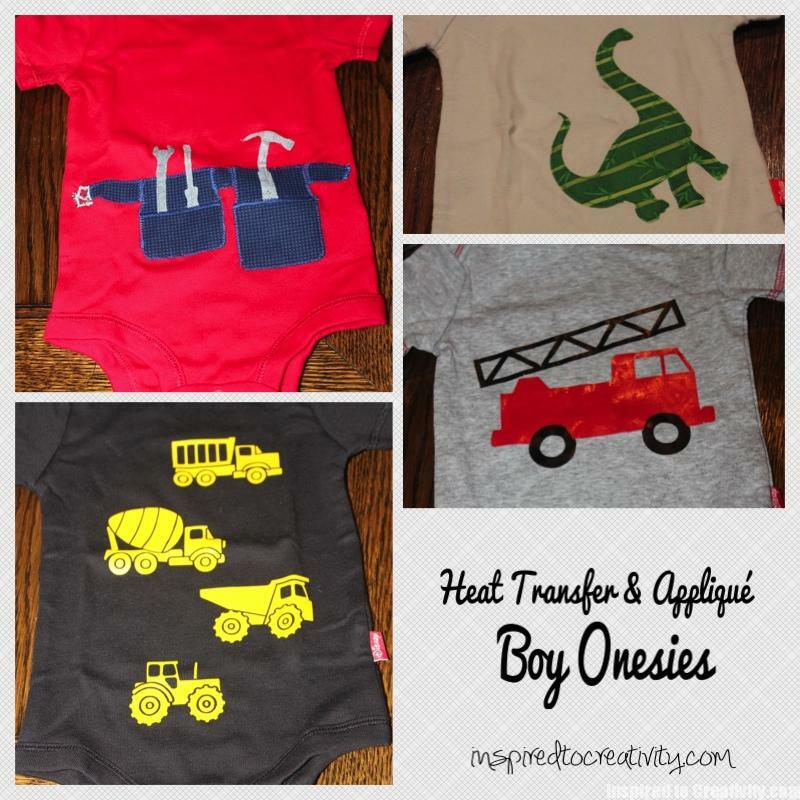 The last onesie was just a simple little firetruck cut out of two different colors of heat transfer vinyl. This was my first foray into layering heat transfer materials and it was easier than I thought, it just takes a bit of patience and ironing multiple times between layers. I made the design WAY too big for the onesie on this – don’t make the mistake of creating designs that are the wrong size for the material.